The Congo. The name alone evokes images of a lush jungle filled with mountain gorillas, bonobos, okapis and some 12,000 unique species that call the forest home. But the Congo basin faces a threat that could irrevocably change the second largest rainforest in the world: an extended drying period that has reduced the jungle canopy over the last 17 years. Should the drying trend continue, it might alter the composition and structure of the Congo rainforest, affecting its biodiversity and carbon storage. 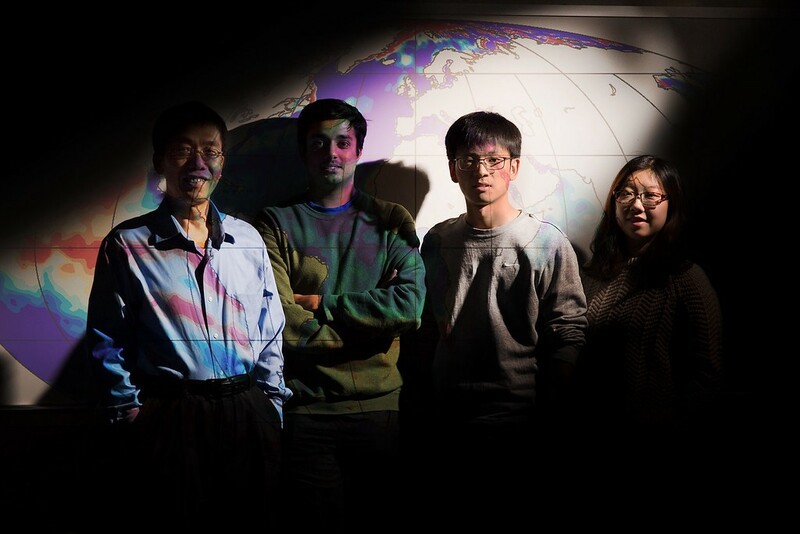 At the University at Albany, a team of researchers led by Associate Professor of Atmospheric Sciences Liming Zhou has been studying this trend. They have worked with NASA to track the reduction of the Congo forest cover, and get a better picture of the impact of the drought. Now, Zhou and his team are grappling with the “why” — what environmental factors are at work to cause the shifting precipitation models. The culprit? The long-term drought during April, May and June over Central Equatorial Africa may reflect the large-scale response of the atmosphere to tropical sea surface temperature (SST) variations, according to Zhou. What remains to be determined is if these changes are the result of natural variability or global warming due to human activities. Appearing in Environmental Research Letters, Zhou’s team states that these results reinforce the notion that tropical SSTs have large impacts on rainfall over equatorial Africa. The authors argue that more work needs to be done to further distinguish the contribution of SSTs changes (such as a La Niña-like pattern and Indian Ocean warming) due to natural variability, or ‘anthropological forcing’ such as greenhouse gases or aerosol pollution. Photo courtesy of World Wildlife Fund. Home to as many as 10,000 species of tropical plants, including 30 percent that are unique to the region, the Congo basin is teeming with life. 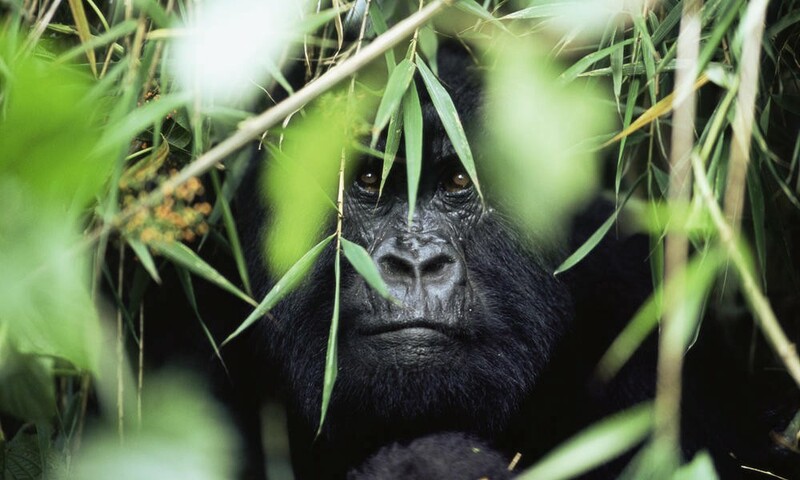 Endangered species such as forest elephants, chimpanzees, bonobos, and lowland and mountain gorillas inhabit the lush forests. According to the World Wildlife Fund, about 400 other species of mammals, 1,000 species of birds and 700 species of fish can also be found in the Congolese rainforest. Oceanic conditions, especially SSTs, have been highlighted as the driver for rainfall variations over Africa and other regions. SSTs modulate the rainfall variability not only via their direct and indirect impacts on atmospheric circulation, but also via their effects on moisture transport. Over the long term, the drying trend is likely associated with rapid warming in the Indian Ocean and western Pacific Warm Pool. Tropical SSTs in other regions also have experienced obvious changes since 1979, with significant warming from the Atlantic to the western Pacific, and cooling in the central and eastern Pacific. These changes contribute to regional climate change through atmospheric ‘teleconnections’ (anomalies related to each other at large distances, typically thousands of kilometers). Even from halfway around the world, the Pacific Ocean has an indirect influence on African rainfall, as well as over the continent. But it remains to be seen if these changes are the result of human activity or internal variability. 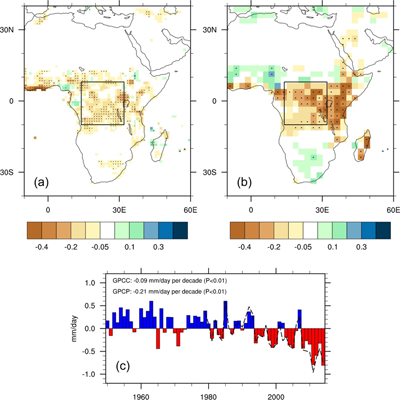 Patterns of rainfall change over Central Equatorial Africa. The study is funded by the National Science Foundation. Other contributors to this research include Haishan Chen at Nanjing University of Information Science & Technology in China, Sharon E. Nicholson at Florida State University, and two UAlbany graduate students, Ajay Raghavendra and Yan Jiang. Featuring one of the largest graduate programs of its kind in the nation, UAlbany’s Department of Atmospheric and Environmental Sciences tackles some of the most pressing scientific issues of the 21st century. As the impact of climate change and extreme weather is felt across the globe, there has never been a more important time to train atmospheric and environmental scientists who can address these challenges. With their broad portfolio of research interests, the Department of Atmospheric and Environmental Sciences faculty offer students opportunities to work with world-class researchers on projects inspired by some of the most pressing questions and challenges facing humankind. 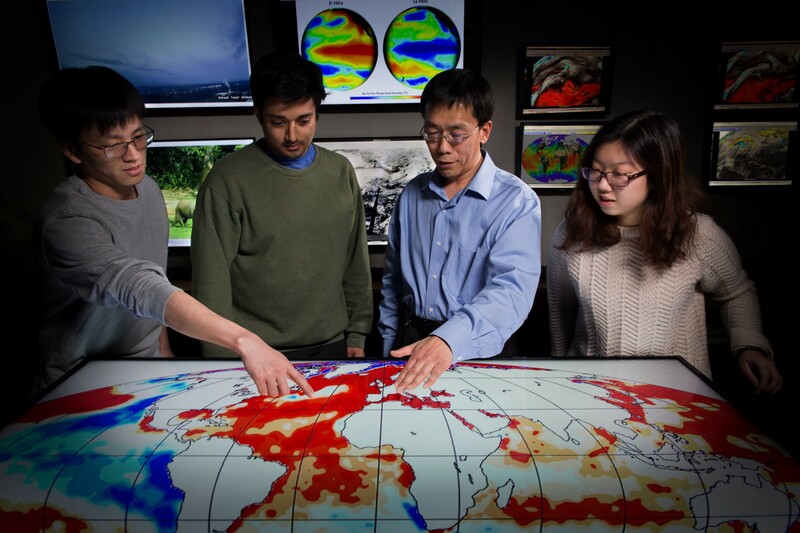 The Department’s main areas of research and study include synoptic-dynamic meteorology, severe weather, climate variability and change (including past, present and future), hydrometeorology, theoretical meteorology (spanning planetary through convective scales), and tropical meteorology including hurricanes and monsoons. Whether it is studying the structure of hurricanes, measuring the effectiveness of extreme weather prediction models, or exploring the impacts of climate variability and change this research has a far-reaching impact on industry, public policy, and the breadth of understanding of the world around us. UAlbany news/information, research and expert perspectives.